Asics GT 2000 5 are stability cushioned running shoes. 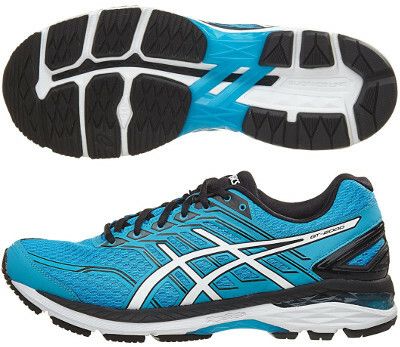 The Asics GT 2000 5 is not going the get the attention of the premium Gel Kayano 23 but offers great value for money. It does not feature latest technologies neither stars big marketing campaigns but definitely one of the most reliable options within cushioned running shoes with pronation support, a great choice for everyday workouts and long distances with affordable price tag. As well as its predecessor the GT 2000 4 major update takes place in the upper with a more open mesh for increased breathability and several fused elements which provide snug and custom fit. Even heel counter remains untouchable performing great stability from the rear while removable ComforDry™ sockliner not only enhances interior's dealing with odour and moisture but also increases comfort with softer feel. As in many other Asics running shoes, there is a Lite Show edition with higher density of 3M® reflective elements to improve visibility on low light conditions. Rest of GT 2000 5 remains the same (it does not feature FlyteFoam™ technology) relying in double density FluidRide® layer for improved response on top of solid SpEVA baseline with rear and forefoot Gel® cushioning system for responsive shock absorption on impact. Regarding stability, midsole combines specific pronation control technology (dual density Dynamic DuoMax®) in the internal side with classical plastic shank (Trusstic System®) in the midfoot for necessary stiffness. Outsole keeps design and materials with durable AHAR+ on more exposed areas.